Switzerland is not releasing any economic reports today therefore USDCHF will be chiefly under the influence of macroeconomic news. However, Switzerland’s producer and import price index rose along with the US Consumer price index. USDCHF is expected to move in higher ranges today. The support lies at 0.97940 with resistance at 0.98440 which both lines are above the weekly pivot point at 0.9742. The EMA of 10 is located above the EMA of 50 showing the price growth over the last recent days. All indicators are signaling buy opportunity such as MACD indicator which is in positive territory, the RSI is above the 50 level and the Stochastic is confirming the upward trend as well. 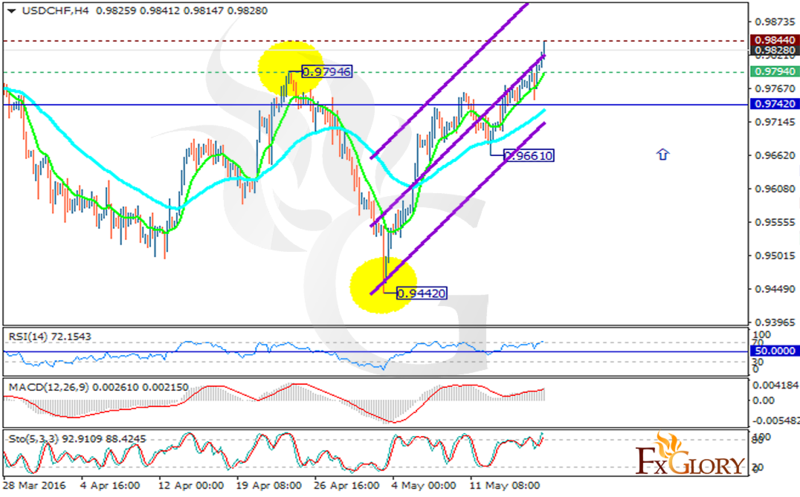 USDCHF rally within the ascendant channel will continue for today. Long positions are recommended with the target at 0.9890.